NICKY Hunt reckons Rotherham United’s supporters have yet to see the best of him. The right-back, a free transfer acquisition from Preston North End in the summer, tore his hamstring in a pre-season friendly with Hearts, an injury which kept him on the sidelines for six weeks. 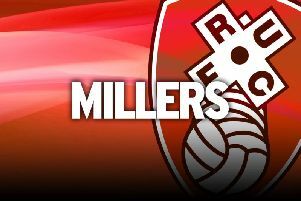 The former England under-21 international has been playing catch up ever since and had to wait until early September to make his Millers debut in the 6-2 drubbing at Port Vale. Hunt has featured in the last seven matches but believes he will get better as his fitness improves. “It has been very frustrating; I played the majority of pre-season and then I got injured,” he told The Star. “It was really disappointing to pick up the knock but it was just one of those things. I am not thinking about that now. “I think I have shown in the last few matches I am fit now. I am only going to get fitter the more games I play. Striker Alex Revell is available after a three-match ban and could be given the nod up front when Rotherham head to lowly Aldershot on Saturday seeking their first away win of the season. Kari Arnason is another senior player who could figure as long as the Icelandic star returns from international duty unscathed. Hunt said: “It has been a mediocre start and not what we were expecting. We have got to get our heads down, carry on working hard, get the results that we need and hopefully around the Christmas period we will be back in and around the top three. Having made over 100 appearances in his career for Bolton Wanderers, several of which came in the Europa League, Hunt always follows their results closely.